By far the best way to justify any trip to Bucharest is by taking a tour through the city's sweltering nightlife. Bucharest long ago put itself on Europe's clubbing map, luring top-deck DJs to the trendiest dance destinations (Kristal, Studio Martin, Bamboo) in town. Today, Bucharest is not only a clubber's paradise, but tempter of all tastes with everything from cocktail bars to cosy cafes, jazz clubs to Irish pubs, tea houses to tawdry taverns. Crawl through them all with our handy club and pub directory and make sure to let us know which watering holes you like the most in Romania's party capital by leaving your own reviews. Na Roc! Sorry i know i am on the wrong area but i would like to know how if someone know more information about the New Bamboo which they re-open again and i would like to know how it look like ! little club with great atmosphere. 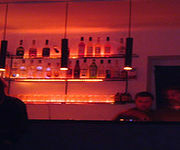 Very CHEAP drinks and special atmosphere. If you want to party with the locals it is a must go. really nice place, cheap drinks and good music. Totally recommend. i here a lot about bamobo, from one of my naughty friend. going to london in aug i will drop in bamboo for fews night. looking forward to bamboo.be there my friend i would sure join y.